This guide is designed to help students locate full text dissertations in Education. When searching most of the search engines or databases, you will need to search for a topic in order to generate a list of dissertations and thesis. Place quotes around phrases. "academic success" "middle schools" "inner city schools"
In ithe United States, a thesis is associated with a master's degree and a dissertation is associated with a doctoral degree. SXU does not have the Dissertation Abstracts database. However, there are a number of tools available that search for online Dissertations. Also see the WorldCat information information on the right side of this page. Select ERIC from the list of databases. You will want to use advanced search and also limit the search results to dissertations which is located under Publication Type. You can search for dissertations with WorldCat. 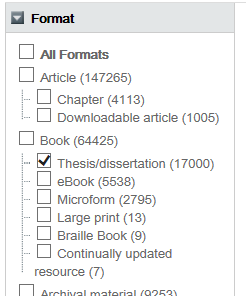 As with ERIC, you will search for a topic and limit the format to Thesis/dissertation. While some of the entries will have links to the full text, you will have to request the others through interlibrary loans.